So, I was going to write you a post about, I dunno, something. It would have been awesome, possibly even stunning or life-changing. But I stopped by Libby Anne’s whilst I was taking a break, and any ideas I had for a post went right out of my head, because you really need to read her post right now. Sally scanned the insert, reading about volcanos and magma and fault lines. “This all looks right, mom!” she told me, surprised. And that—that right there—is one of the most powerful tools young earth creationists use to win people over to their position. They include enough accurate scientific information that the bits that are wrong are generally surrounded by bits that are completely correct. It’s like putting a pill in chocolate pudding. And so I took the insert from Sally and showed her the points that were incorrect—namely, sentences that referenced the floods or geological timetables centered on the flood. By my count, there were only three incorrect sentences in the entire insert. The remainder of the insert covered standard scientific information. Imagine a person who believes in God and the Bible but has been taught the theory of evolution. Then a friend who is a creationist shows them scientific books showing that actually, science reveals that God created the world in six days. This friend takes them to an Answers in Genesis conference at a local church where they hear credentialed scientists using scientific-sounding language to reveal that evolution is fundamentally flawed and that geology indicates a young earth and a recent creation. It’s not surprising that the young earth creationism packaged and marketed by Answers in Genesis is so convincing to so many. It has a scientific veneer that gives it seeming credibility. So, yes, go read the whole post. And then, if you’ve got some time and you’re bored, you can peruse our Adventures in Christianist Earth Science Education archives, and note how they slip their drivel in amidst sensible science. That’s one of the reasons I’m going through all of these textbooks page by page. The more we know about how they’re doing it, the better we can counter it. 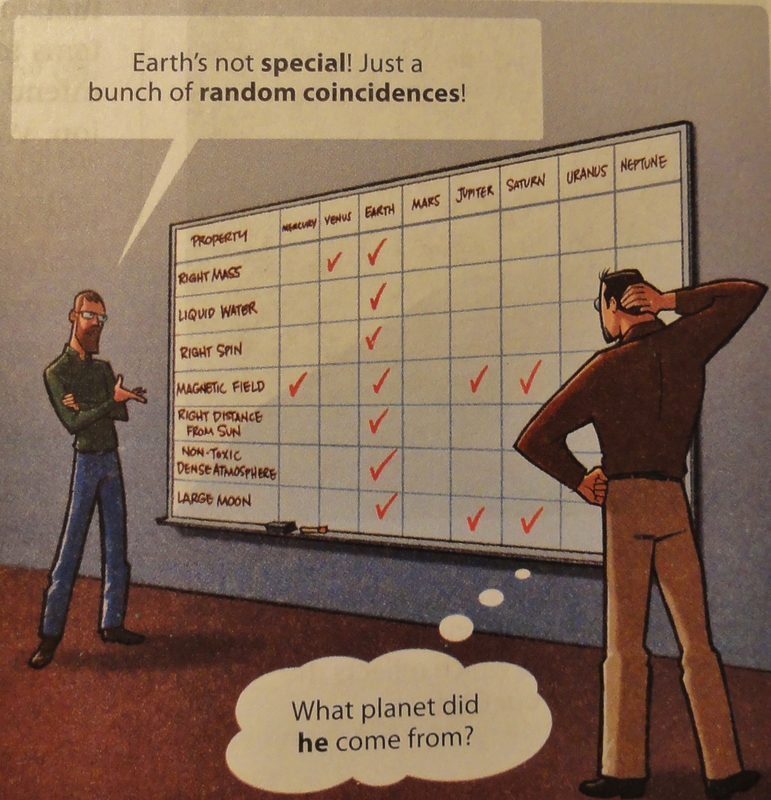 A cartoon from BJU’s Earth Science 4th Edition. They make a huge effort to present themselves as the sensible and scientific ones. I’m sure you can tell which one’s the secular scientist from the silly creationist trope about said scientists they have him spewing. ← Your Cascadia 1700 Post is Here! BJY uses cartoons in their science books – that says it all. @ ^ busterggi : Well, I wouldn’t say cartoons in science books are always a bad thing, they can be used well to make them more interesting and memorable and amusing. Think I’ve seen a few cases where this has been done legitimately. This, of course, would NOT be one of those cases. Apart from leaving out Pluto (grr ..wrong!) there are several other errors in that cartoon starting with leaving out the ticks for magnetic fields and large moons – though I guess you need to define large moon – in the cases of Ouranos & (possibly hidden by scientist but still) Neptune. Mars also has relic localised magnetic fields as well. The column about “Right Spin” is also dubious – presumably it refers to the planet’s rotation rate or day in which case Mars should have a tick at least ( 24 hours 37 minutes 22 seconds just a bit longer than ours) and it isn’t clear why that other planets such as Saturn and Jupiter with shorter days would thus be rendered unsuitable because of that. Not sure why that’s really listed as an important intrinsic key feature. Note that even a tidally locked planet that has, in effect, permanent day / night could be habitable in the right circumstances , e.g. atmospheric circulation allowing particular suitable zones that are medium temperature with circulating water (or other?) fluid cycles. This idea has been modelled in for instance the case of many (fictional and proposed and even actually confirmed) red dwarf exoplanets and discussed in SF for decades. Its also been hypothetically considered and modelled as to what might happen on worlds with “wrong spin” such an Erath-liek world tilted sdeways the way Ouranos and Pluto orbit. Looks like there’s also a sequel titled ‘What if Earth had Two Moons’ by the same author (?published? 2010?) which I don’t recall reading or seeing. To me this is just the same old sales pitch religion has been using for eons. Virtually every faith has a rational, reasonable, lovable, meaningful, truthful, flexible, sane, safe, etc. “veneer” to it, that they always (attempt to) present to the world while (again, attempting to) restricting their really silly crap to a “need to know” basis. It’s only after new people have developed some kind of dependence upon members of a given faith, and perhaps even to the institution itself, do religionists willingly open the conversations to include all the really stupid crap. There has always been a “science” veneer to religion (and a “philosophy” one, and a “we’re groovy” one, and “we love you” one, etc. ), but for the most part its simply been too thin to work very well. Its actually the entire mission of AIG and Ken Hamm — for decades now — to “fix” the failure of this particular veneer, so its no surprise to finally see some of their literature “passing” the lower bar (i.e. looking “okay” in the eyes of a young skeptical child…as well to the eyes of a highly-religious PhD). This kind of “veneering” is precisely why religion is far more like a plague than simply being a minor social annoyance. And, more now than ever, the only viable inoculation against the religious “disease” is to teach our children to be skeptical (as Libby Anne demonstrates to be doing in her post with her own child).